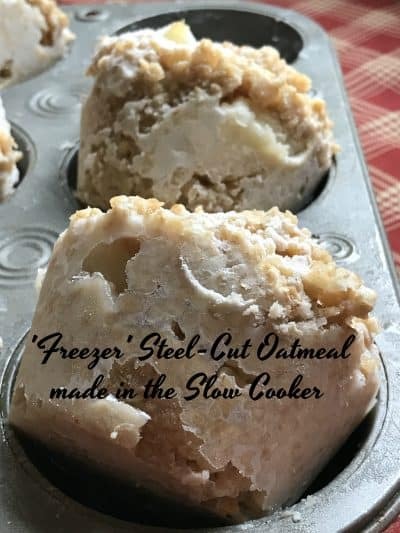 Freezer Steel-Cut Oatmeal in Slow Cooker is a fantastic recipe for making steel-cut oatmeal. 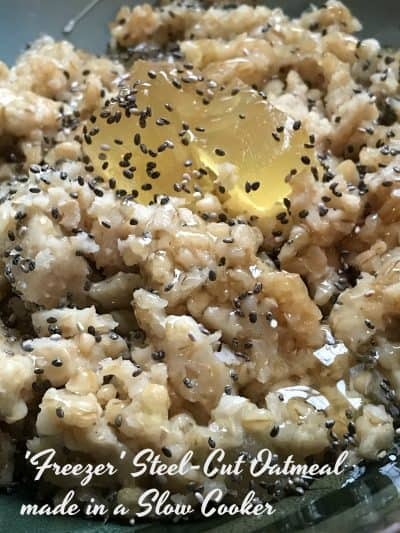 With the winter months ahead and the weather starting to get colder, you might want to start stocking your freezer with this fantastic oatmeal recipe. Make a double batch of steel-cut oats in your slow cooker. When your oatmeal has finished cooking, spoon into muffin tins and freeze until firm. Breakfast is ready for the rest of the week! What did that say? Oatmeal, Slow-cooker, Freezer? Let’s back up here for a minute. First off you did read that right, recipes for making steel cut oats in the slow cooker have been around for sometime now, with good reason. Steel-cut oats are made easy in a slow cooker. Everything is tossed into the slow cooker, turn it on high and in a few hours, you have oatmeal. If you have ever searched for recipes for oatmeal made in the slow cooker, you’ll find a ton. Personally I like oatmeal, always have. I like steel-cut oatmeal, also know as Irish oatmeal, even more. When slow cooker oatmeal started to appear everywhere, I was thrilled. It’s a great way to add some variety to your breakfast and extra fiber, if your into that sort of thing. Even my grandson loves slow cooker oats. What I don’t like about slow cooker oats, is that most recipes I’ve tried, (it seems to me anyway) that the cooking times are off. What exactly do I mean by that? Some recipes call for cooking the oats overnight in the slow cooker and I have done that. In the morning I’ve woken up to a burnt mess. Other recipes say to cook the oats overnight or for 4 to 6 hours on low?? I’ve often wondered, “What time to these people go to bed?” From reading the directions, they certainly don’t need much sleep! I get up every morning at 7:00 am to let the dogs out, so that would mean? So that would mean that I would have to make and start my slow cooker overnight steel-cut oats at 1:00 am? I don’t think so. That’s what I mean by ‘the cooking times’ are off. Don’t get me wrong, I myself have recipes on Turnips 2 Tangerines that have the same directions, which I might add, I’m going to change right after I write this post. So how can we solve this culinary dilemma? Easy! Freeze It!! Now that your kids are back in school and everyone has settled back into a routine of sorts, why not make your mornings even easier by having these steel-cut oats waiting for you in the freezer. 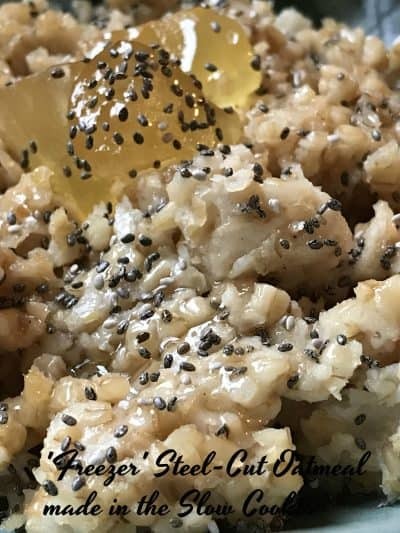 On the weekend, when you have extra time or the weather keeps you inside, make a double batch of this oatmeal in your slow-cooker. When the oatmeal has finished cooking, follow the simple directions below. After your oatmeal has cooked on high for 4 to 6 hours, allow oatmeal to cool. 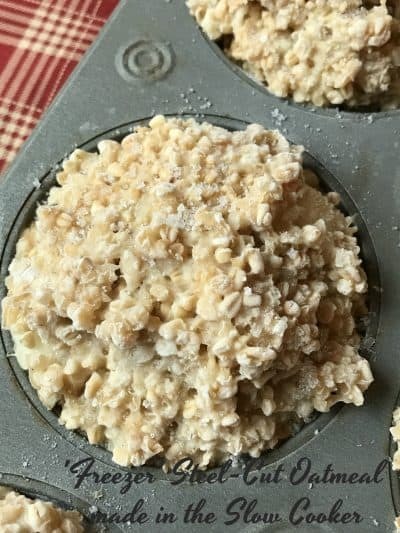 Spoon cooled oatmeal into jumbo muffin tins (1 cup size) that have been sprayed with a non-stick cooking spray, freeze overnight or until firm. Remove the frozen oatmeal muffin tin from freezer. Allow to sit at room temperature until oatmeal ‘muffins’ can be removed from tin. Use a butter knife to carefully pry ‘muffins’ out of tin. Divide oatmeal ‘muffins’ into six individual zip lock freezer baggies and return to freezer until ready to serve. When your ready to serve your freezer steel-cut oatmeal, simply place one freezer oatmeal ‘muffin’ into a microwave-safe cereal bowl. Heating directions will vary from microwave to microwave depending on wattage. My microwave is only 700 watts. The directions I give will be for a 700 watt microwave. Heat on defrost for one minute, add a small amount of milk or coffee creamer. Heat for another minute or two on high. Serve with candied pineapple, chia seeds and drizzle with honey. 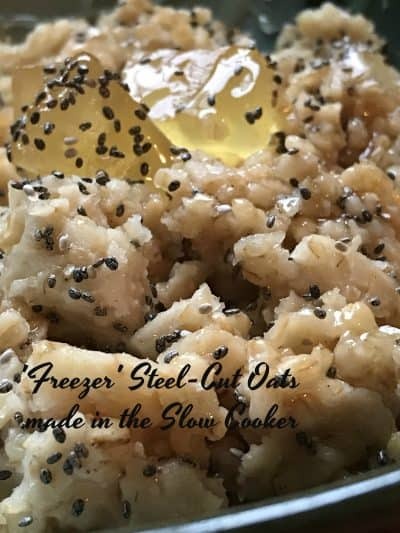 Freezer Steel Cut Oats in Slow Cooker is super delicious. 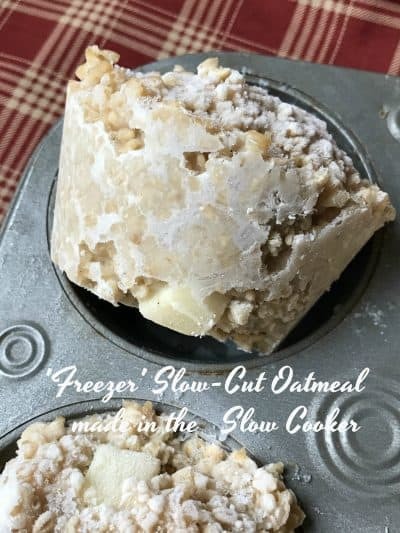 Freeze steel cut oats made in the slow cooker in individual serving sizes and reheat in the microwave for breakfast on chilly mornings. 1 8 oz container candied pineapple, set aside 1/4 cup for topping Paradise Fruit Co. Coat the inside of your slow cooker with non-stick cooking spray. Combine remaining oatmeal ingredients and cook on low for 4 to 6 hours. Stirring oatmeal when convenient throughout the cooking time. Turn slow cooker off and allow oatmeal to cool. Spray jumbo size muffin tin (6-muffin size) with non-stick cooking spray. Spoon oatmeal into prepared jumbo muffin tin, mounding oatmeal in tins. Allow to cool slightly. Loosely cover the muffin tin with plastic wrap. Place filled muffin tin in freezer. Freeze overnight or until frozen. Remove muffin tin from freezer. Allow to sit at room temperature for 10 to 15 minutes. Remove oatmeal muffins from tin. Divide frozen oatmeal muffins among individual serving size portions in zip-lock freezer bags. To Serve: Place frozen oatmeal muffin in a microwave cereal bowl. Cover, microwave on reheat for 1 minute. Add a small amount of milk, cream or coffee cream if you like a creamier oatmeal and stir. Microwave 1 to 2 minutes longer or until oatmeal is heated through, stirring as necessary. Serve with additional candied pineapple, chia seeds, honey and coconut if desired. For this recipe we used Coconut Milk by Mira and candied pineapple from Paradise Fruit Co.
*Recipe Note: I have been developing recipes using Paradise Fruit for the past several months. Please take the time to check out all the recipes using Paradise Fruit and visiting Paradise Fruit Co. online. Thank-you for supporting Paradise Fruit Co. the company that supports Turnips 2 Tangerines.Fruitcake Fudge, Pear Ginger Upside Down Cake, Tropical Smoothie Bowl, Chocolate Covered Cherry Brownie Bites and Orange Hazelnut Sourdough Scones.